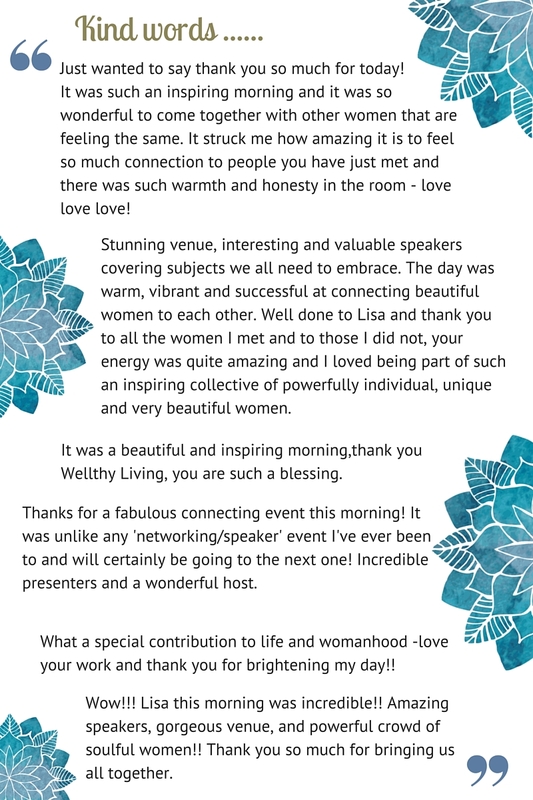 Wellthy Living collective wisdom is an inspired talks and an authentic connection monthly event series. It is a place to connect with like minded women and experience a balance of joy, depth and sacred connection. A place to be seen and heard. A place to show up in all your awesome uniqueness and know that no matter where you are in your biz journey you are a gift of inspiration for someone else. Maybe you run a thriving business or perhaps you have an idea, one that sets your heart on fire, but you are struggling to bring it to life alone and you are feeling overwhelmed. I'm on a mission to help people to live a magical life by making self-loving choices so they can share their unique gifts and honour themselves wholeheartedly. This series offers a dynamic yet relevant experience, one that's filled with wisdom, inspiration, practicality and nourishing conversation.